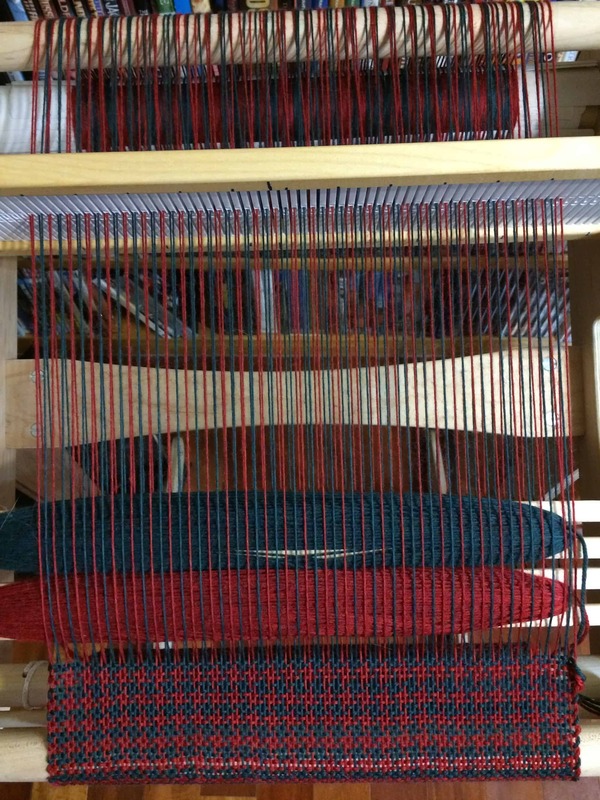 One of the FAQs inkle weaving newbies always have is how to figure out how wide their finished band will be. The advice given generally is that it varies from one yarn to another and one weaver to another. You’ve got to keep records to see what works for you. I recently saw another person ask this question and this time I got inspired. If different weavers used the same yarn and the same draft, much variation would there be between the width of the finished bands? So I designed an experiment to try to figure that out. I’m looking for volunteers to participate! You must weave your band with #10 crochet cotton. You must weave the draft below. 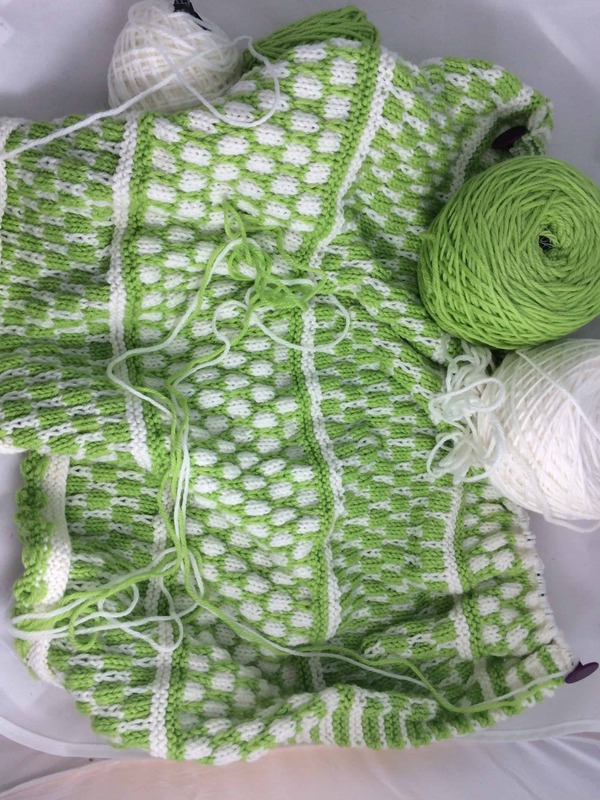 You may use any 2 colors you wish, as long as you use #10 crochet cotton. Please measure the WPI of the two colors you are using and write down your results. 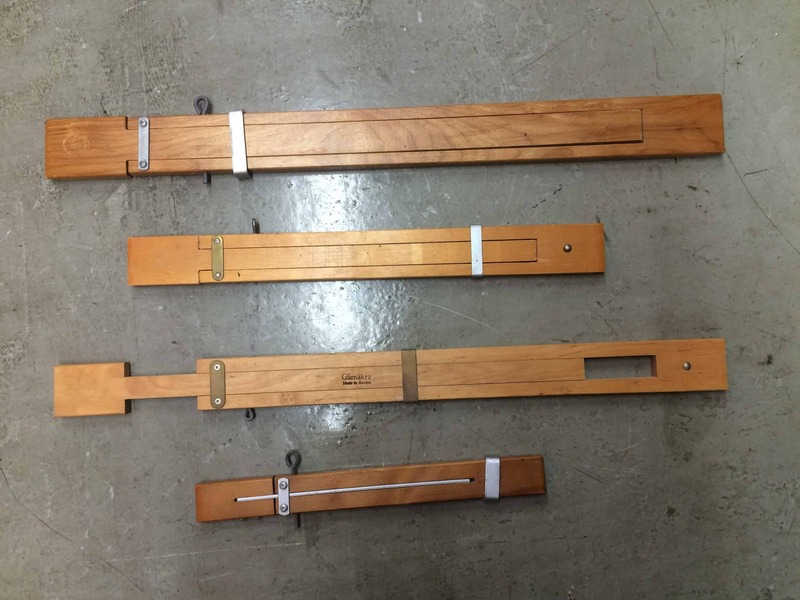 Measure the width of your finished band. Take a picture of your finished band on a ruler showing the finished width. Complete the survey on this Google Form. You may weave more than one band, if you wish to experiment with different brands of #10 crochet cotton or different colors of the same brand. Complete the survey once for each band you finish. All results received by April 25, 2019 will be compiled to determine the extent of variation in band widths. I’ve created a GOOGLE FORM to collect results. Approximately 1 week after the deadline, I will post the results here on my blog. I hope you are as curious as I am and decide to weave a band or two! In October 2016, I went to the Southeastern Animal Fiber Festival (SAFF) with several friends. A subset of those who went are members of the monthly spinning group I attend. 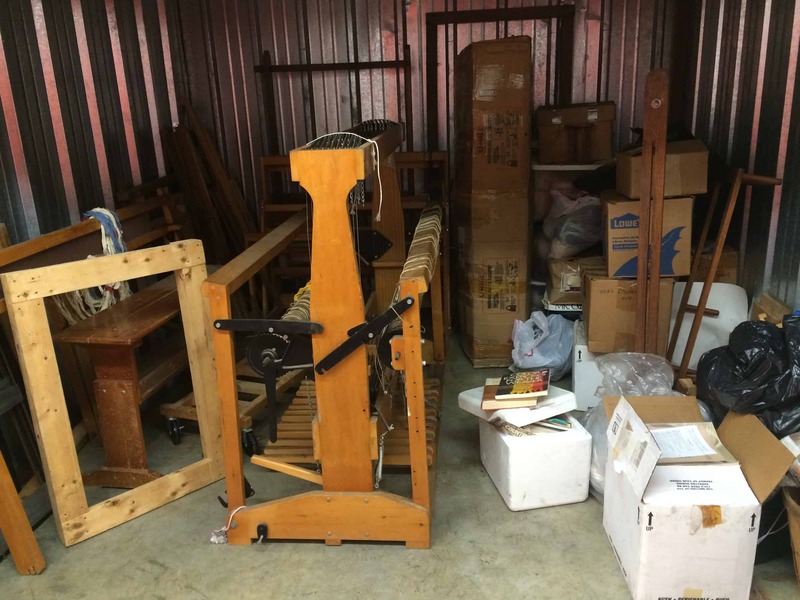 We found a good deal on an unfinished Kromski Fantasia and split the cost so that we could have a spinning wheel to use for teaching people to spin when they stop by our group or for members of our group to borrow to learn to wheel spin. I brought the wheel home to finish it. I decided to finish the wheel with Danish Oil. 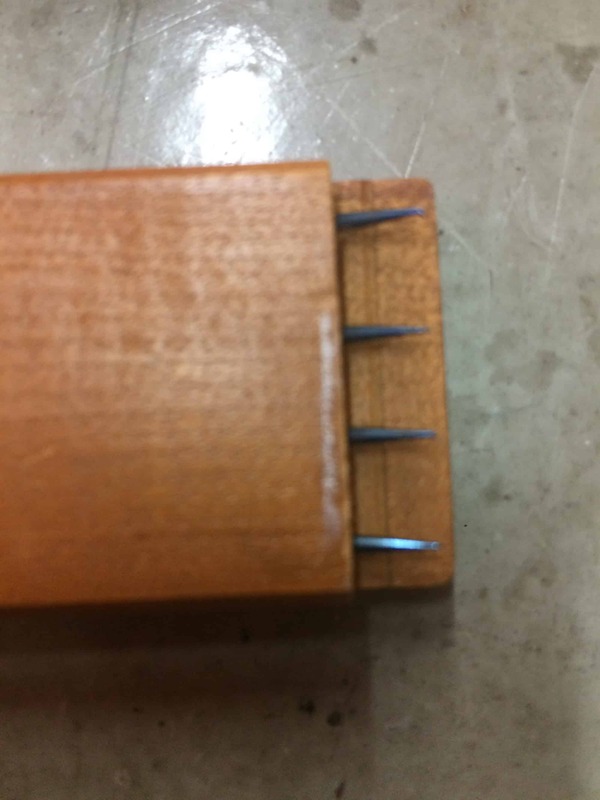 I also decided to apply Danish Oil to my 15″ Schacht Cricket Rigid Heddle Loom. I started working on both in December 2016. I applied clear Danish oil to the wheel and dark walnut to the loom. I applied three coats, waiting at least 24 hours between coats and making sure that they were dry to the touch before applying the next coat. I was trying to finish them before Orlando Distaff Day 2017, which was on the first Saturday of 2017. I signed up to do a wheel assembly demo and planned to bring all the parts of the Fantasia with me and assemble it at the event. Early on the Friday morning before Distaff Day, I applied the fourth and final coat of Danish Oil. That Friday night and into Saturday morning it POURED. We’d had no rain for weeks and it felt like the sky had saved all the rain we should have gotten and dumped it all at once. The pieces of the loom and wheel were on the workbench out in the garage, which is where I’d been working on this project. The garage is not climate control. When I got up on Saturday morning, the loom and wheel were both tacky to the touch. In fact, they were tackier than they had been when I applied the fourth coat on Friday morning. Obviously, there was no way I could bring them to Distaff Day! I left the loom and wheel on the workbench for 3 or 4 weeks. They were still tacky. I brought them into the house, and laid them out around the house on any spare flat surface. I figured they would dry better in the climate-controlled house. Every month or so, I checked the pieces and they were still tacky, though it did seem as though they were slowly improving. In the spring and summer of 2017, I took some woodworking classes, including one on finishing wood projects. I asked the teachers about my problem. They shook their heads. In all likelihood, the reason for this problem was that the earlier coats weren’t cured as well as I thought they were. I could continue to let the pieces to sit. 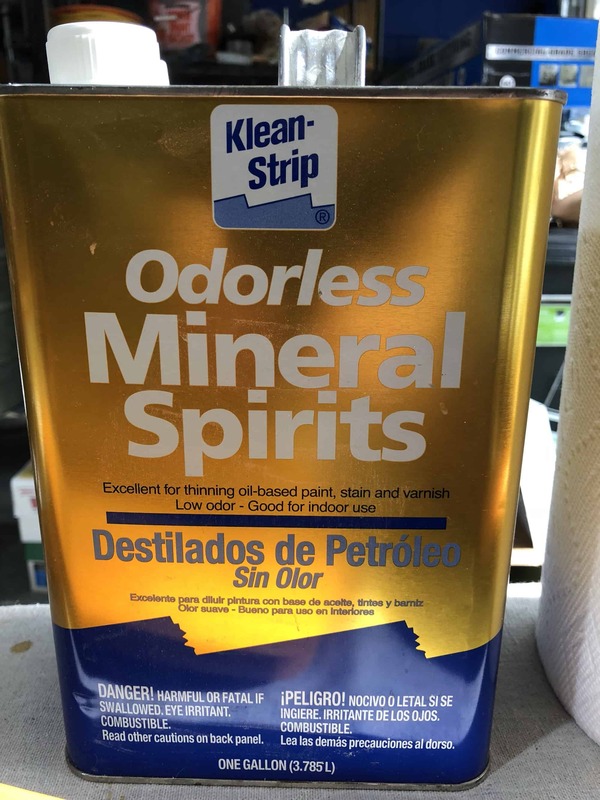 I could try to wipe them down with mineral spirits, which is the solvent for Danish Oil. Since the fall of 2017 was so crazy here — Hurricane Irma left us with no power and no water / water restrictions for a week, my mother-in-law’s health declining, my husband getting laid off — I did not think about the loom and wheel pieces at all. When I checked them in late December, for the first time in months, I discovered that they were slightly sticky, but not so much so that you could see my fingerprint on the surface. I decided to try wiping them down with mineral spirits to see what happened. 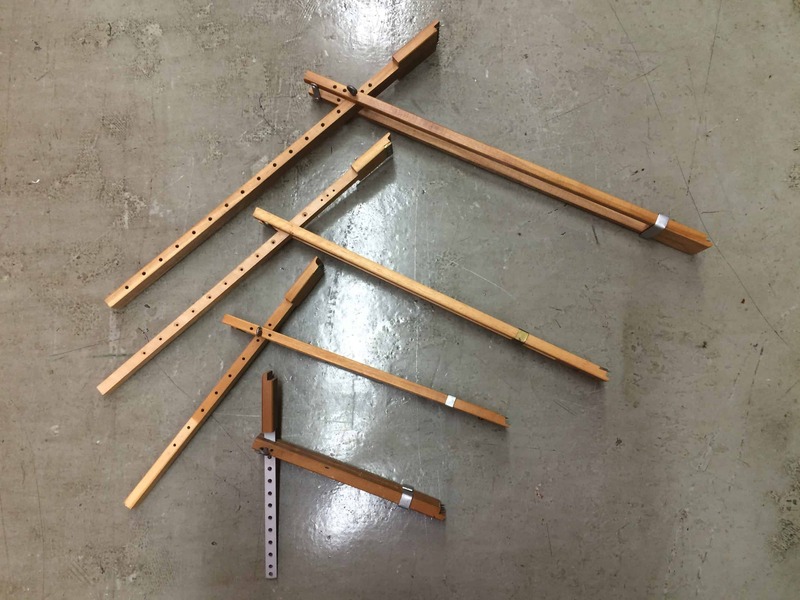 I did just the pieces of the stand for the rigid heddle loom. I figured that was the easiest thing to replace if the mineral spirits ruined the pieces rather than improving them. I wiped the pieces down three times, letting the pieces dry in between. Then I had something else to do and forgot about them. When we came home from our Christmas in New Jersey, my husband finished the project he’d left on the workbench when he unexpectedly left 3 weeks earlier. Then he asked me what projects I have to do. Due to the high humidity of our summers, woodworking is a winter task here and he knew that I’d been saving up some projects, waiting for the weather to co-operate. I checked the three pieces of the loom stand and found that they were no longer sticky. The mineral spirits worked! For the past two days, I’ve been working on the remaining loom pieces and the wheel pieces. This morning, I wiped down the pieces with mineral spirits for the fourth time. The repeated coats of mineral spirits seem to be doing their work! It’s been humid the last two days and I think that this has caused more of the oil to come to the surface. Despite this, the pieces are clearly improving and becoming less sticky overall. For some of the pieces, this fourth coat should be the last coat I need to apply. I will need to flip a couple of the pieces over so I can do the back. My previous despair and fear that I’d ruined two expensive pieces of equipment have given way to hope. I think this is going to work! This year, we spent Christmas with my in-laws. My mother-in-law is in poor health. She has cancer and then got pneumonia. She was in the hospital for 2.5 weeks, moving to rehab on the Tuesday after Christmas. For a while, we thought she wasn’t going to make it to Christmas, but she did. For the moment she’s stable, but the cancer is advanced and at this point we count each day as a gift. During the time I visited with her, we talked a lot about her life and what has been important to her and what is important to her now. 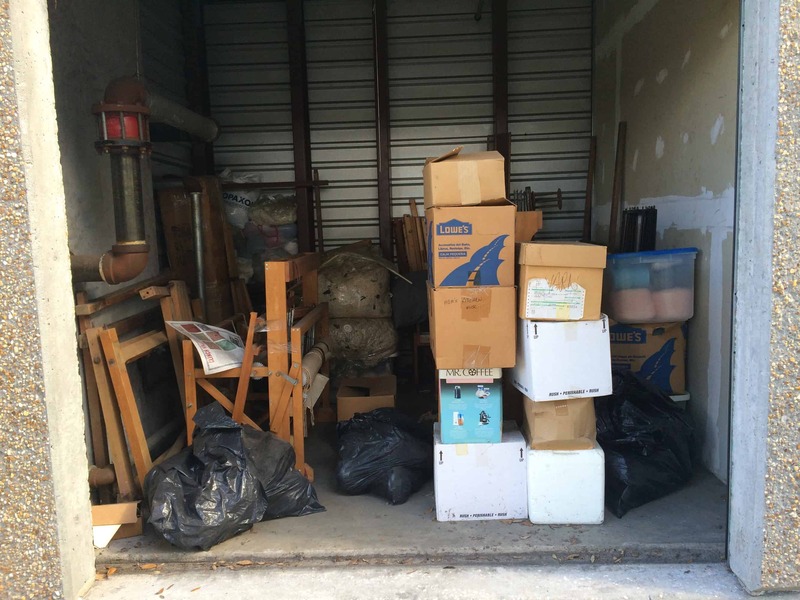 “None of that stuff matters to me anymore,” she said, referring to her physical possessions. What matters to her is speaking with and spending time with her people — her children, grandchildren, siblings, nieces, nephews, friends. In November, my husband was laid off from his job. This was something we’ve expected for some time, so we’ve saved money and he got a severance payment, so we are not in an immediate financial crisis. He spent most of the last six weeks with his mother and is now starting to look for a job. We don’t know how long it will take for him to find a job, so we need to manage carefully so that the money we have lasts for as long as possible. As a result, buying yarn and fiber are definitely off the list! I must craft from stash. These two factors have me thinking a lot about what really matters and about how I want to spend my time. I am feeling the need to let go of some things and consolidate others. I want to spend more time on my fiber pursuits. Over the last few years, I’ve acquired an astonishing variety of fiber books, tools, and supplies. I’ve acquired things at a much quicker clip than I’ve crafted them. Once upon a time, I kept Ravelry up-to-date, but I fell out of the habit. I feel as though I don’t really know what I have anymore and to make plans, I need to know what I have. It’s time for an inventory. Fortunately, inventorying is in my blood. For most of my growing up years, my father worked in stock rooms. When I was very small, he worked in the warehouse of a local clothing store. When I was 11, we moved to a different state where he had a new job as the manager of a hospital stock room. My sister and I went to a private school in the same town as the hospital, which was a 30-minute drive from where we lived. We commuted with my father. Since we got out of school a couple of hours before he got out of work, we spent those hours at the hospital. We usually stayed in the cafeteria, working on our homework. Sometimes, especially on days when they were short-staffed, we hung out in the stock room, working on homework and occasionally answering the phone to take orders from the floors while the employees pulled and delivered the needed items. Twice a year, on a Sunday, the stock room closed for inventory. All the stock room employees came in, along with people in other administrative departments, and my sister and I. We counted every single item on every single shelf, balancing the inventory against the computer. I started my personal inventory process before Christmas. 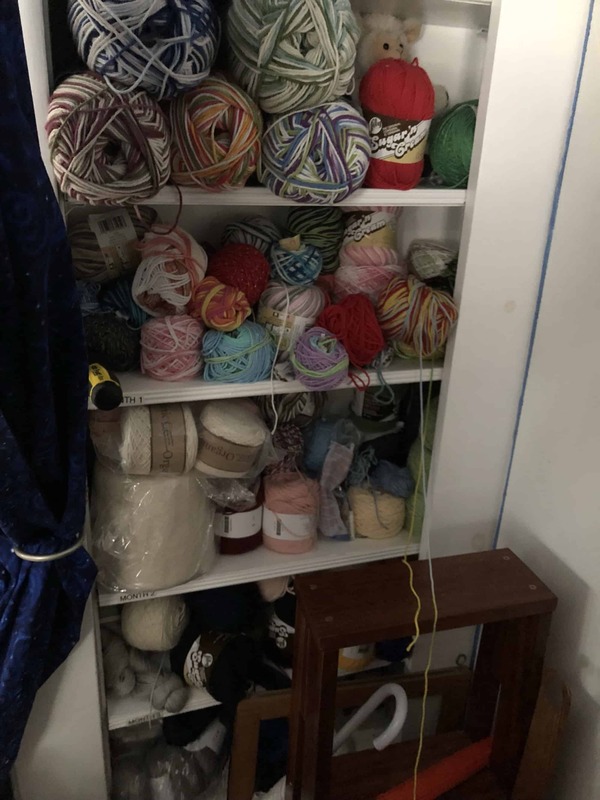 I started by consolidating — putting away all the random yarn and projects scattered around the house. It’s a lot easier to do inventory when everything is where it belongs. It’s a little scary to flash my stash, but here’s the pix so you can see where I am now. 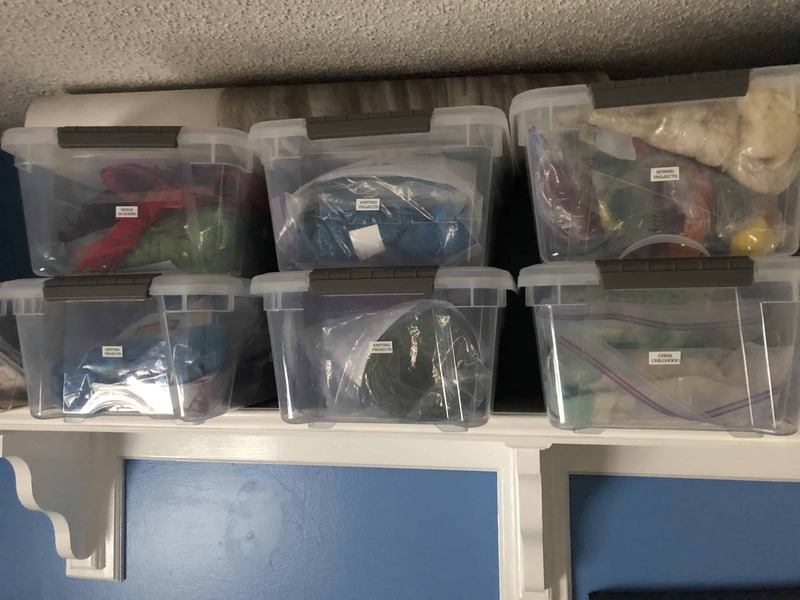 These bins are the main stash collection. Each of these is a 40 quart bin. 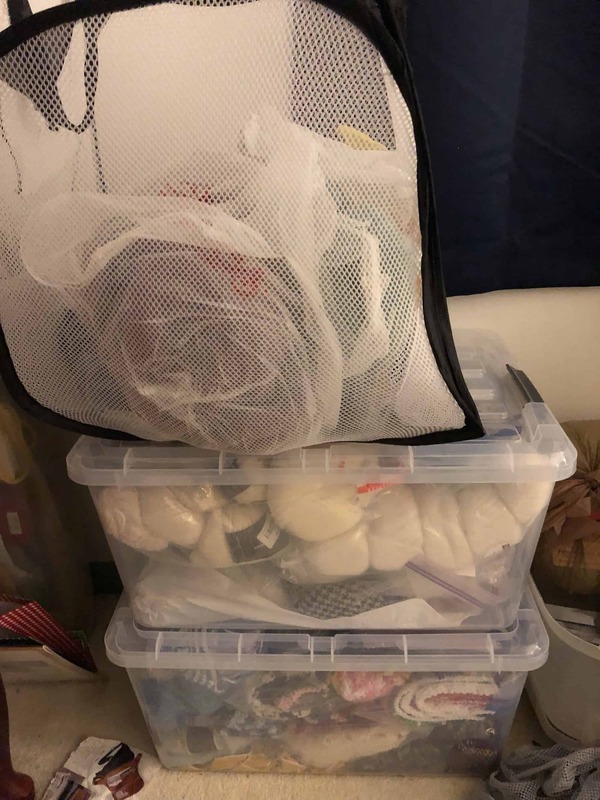 One of the bins holds finished projects waiting to be gifted, but the rest are full of yarn and fiber. 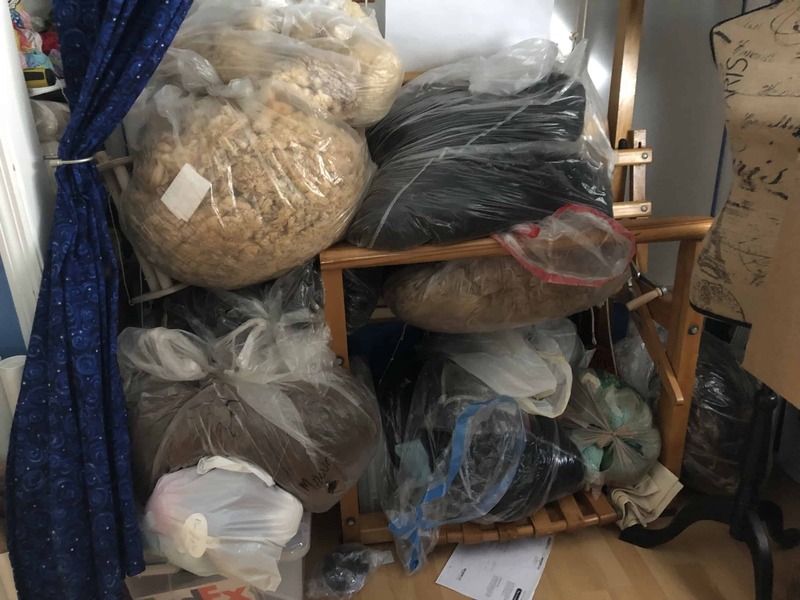 I sorted the fiber by type (wool, plant fiber, blends, batts, etc). There’s so much wool that it takes up 8 bins and I’ve alphabetized the wool by breed. I separated the yarn by weaving yarn and knitting / crocheting yarn. Then I sorted each of those categories size of the yarn. These shelves hold the yarns made from plant fibers. It’s mostly cotton, but there’s some linen and bamboo in there also. These batts have been living in this suitcase since I bought them last April because I can’t fit them anywhere else. This pile consists mostly of raw fleece, waiting for me to wash and process it. There’s also a couple of bags of yarn that I haven’t put away. That’s my four-harness, 28″ weaving width LeClerc Fanny counterbalance loom under all that fleece. 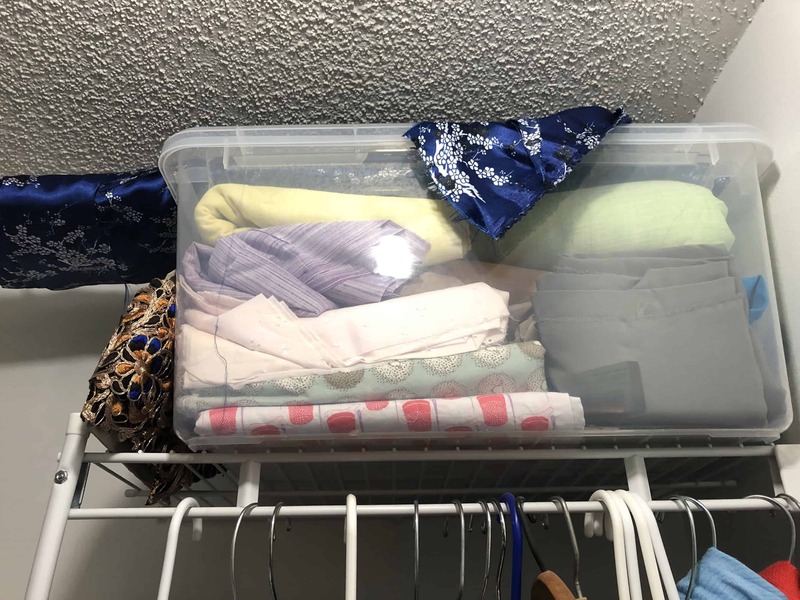 This bin holds raw fleece in smaller quantities. There’s a variety of breeds in this bin, but no more than a pound from any one fleece. These boxes hold fleeces that I bought and had processed by mills. 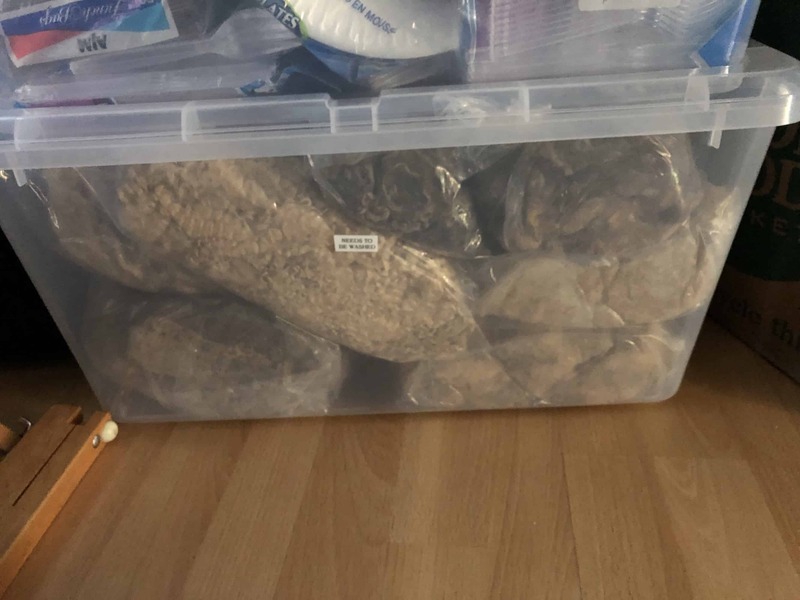 I believe there’s three fleeces total in here. They are sitting on top of my four harness, 22″ weaving width Dorset direct tie-up loom. 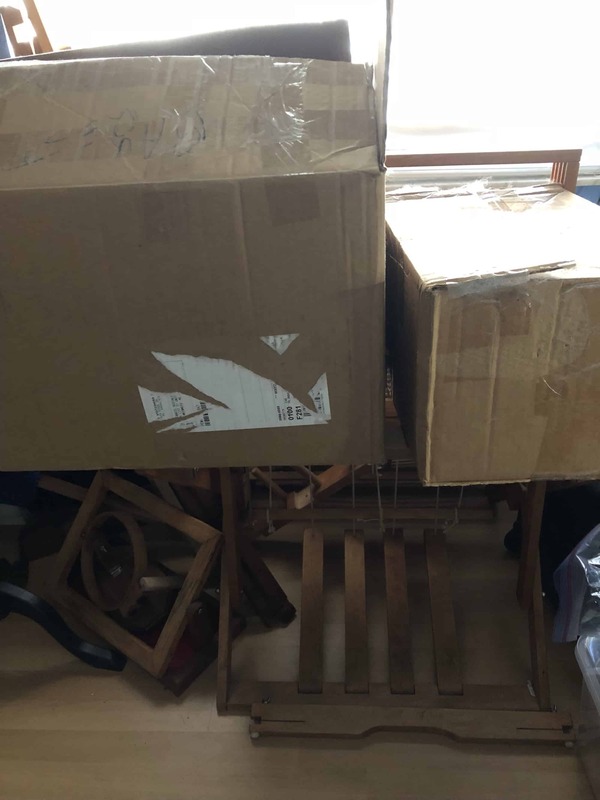 These bins and the hamper on top of them hold WIPs. A couple of years ago, I conquered all my WIPs, but now I have a new pile. These are smaller bins, about twice the size of a shoebox. They hold a couple of WIPs, including two or three that only need blocking, but mostly they are projects waiting for me to cast on. I matched yarn to patterns and sometimes the needles are with them also. Finally, this is my fabric collection. Last spring and summer, I took sewing lessons. I’ve mostly sewed pillowcases, which we send to the pediatric oncology ward where my cousin works, for nurses to distribute to the kids. I actually have a lot more fabric than this, but everything I bought for pillowcases is stored at my mother’s house. This is everything I have at my house. I have complicated feelings about all this stash. I’ll be writing more about it as I continue the inventory process. My goal for the next week is to get Ravelry back up-to-date. I’ve downloaded the spreadsheet of my Ravelry stash as a starting point. I’ll write an update next week, to share my progress and next goal. 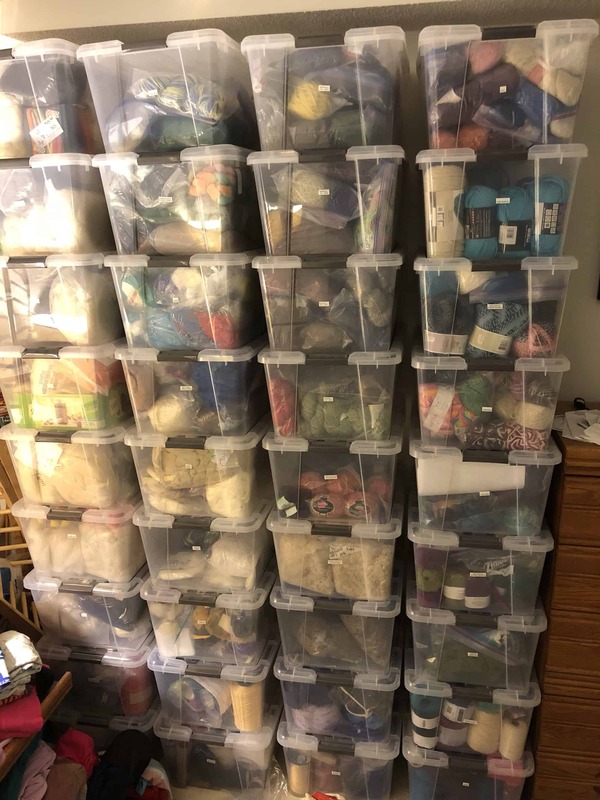 “Why would you spend $25 on yarn to knit a pair of socks when you can buy a dozen pairs at Walmart for maybe $10?” Every crafter I know has been asked some variant of this question. Usually the crafter stumbles through a response, defending the reasons she or he chooses to work with fiber. Afterwards, the crafter might rant on Facebook or Ravelry about the latest inquiry they’ve gotten along this line and how non-crafters just don’t get it. There are many wonderful reasons to craft with fiber; Franklin Habit’s recent blog post on Lion Brand Yarns site provides a far more eloquent explanation than I’m able to write and the comments on that post share many personal perspectives on the question. I believe it is valuable to share our reasons for crafting with fiber. Maybe you’ll inspire someone to pick up needles or hooks and yarn! But perhaps you don’t want to share your personal perspective with the latest random stranger to comment on your work. Or perhaps you have a relative or co-worker who has commented multiple times and discounts the reasons you have given. For these circumstances, I propose the kind of practical, emotion-free response the Inquisitor seems to require: the Crafting Cost Per Hour (CCPH). I read Your Money or Your Life (Amazon affiliate link, Summary on author’s website) a couple of decades ago, when I was in my early 20s. The book offers a 9-step method for transforming our relationship to money. The book starts with the idea that we exchange our time for money. One step is to calculate exactly how much you are paid per hour. This amount isn’t the hourly figure your employer uses to calculate your pay. You add into your weekly hours the time you spent on work-related tasks like commuting and you deduct from your weekly gross salary the costs related to your job, then calculate your actual hourly rate based on these new figures. For example, let’s say you work 40 hours per week and are paid $10 per hour for a weekly gross salary of $400. Perhaps your commute is 1/2 hour each way on public transit and you pay $80 per month = $20 per week for a monthly transit pass, which you use only to get to and from work. These commuting expenses and time mean that your weekly gross salary is reduced to $380 and your work hours increased to 45 hours per week. Your actual hourly wage is $380 / 45 hours = $8.44. The summary link above has a list of other work-related time and expenses that you can contemplate if you wish to calculate your own hourly wage. In the Your Money or Your Life method, once you calculate your hourly wage, you then divide every expense you have by that hourly wage to determine how many hours of your life you traded for that item. Then you evaluate that item by asking yourself if the number of hours you traded for that item are as valuable as the item itself. While I have not consistently followed the steps of Your Money or Your Life, some of the ideas have stayed in the back of my mind and, when I saw yet another post about a Cost of Sock Inquisitor, I was inspired to calculate what each hour of craft costs. If you’ve purchased finished yarn and then knit, crocheted, or woven it into finished object, calculating the cost per hour is straightforward. Simply divide the cost of the yarn by the number of hours it took (or will take) you to finish the project(s) you will knit with that yarn. Some people try to convince you that spinning is even more expensive than knitting or crocheting. However, when looked at from the perspective of CCPH, that isn’t necessarily the case. If you purchased a 4 ounce braid of spinning fiber for $30, spun and plied it, then knit it into a pair of socks, your CCPH is lower than knitting socks with purchased yarn. If you mostly just want to respond to Inquisitors, you can use the basic formula and create a rule of thumb for the projects you most commonly knit in public. Maybe your carry around project is always socks and you know about how long it takes you to knit a pair. Calculate your CCPH once for each type of project and you’re done. I know that many of you profess to not like math and for you, the basic crafting cost per hour will be sufficient to respond to the Inquisitor. Feel free to skip this section. But I happen to love math, and there are many knitters who love math also. Perhaps you might decide to calculate the CCPH for every project you do, just for fun. We all know that our fiber crafting projects cost more than just the yarn or fiber for that project. We have costs for tools, classes, storage. We also know that the benefits are more than just the finished project. We spend time with friends while we craft. We watch less TV, or TV time is productive because we are crafting, not just sitting. These costs and benefits are variable, personal, and more difficult in the accounting. However, these types of variable and personal costs are considered in the Your Money or Your Life method, and I believe we can consider them in our context also. I’m only going to explore two factors — tools and time — in depth, but use this as inspiration to think carefully and creatively about the costs and benefits associated with your fiber crafting! If we choose good quality tools, fit to the task, they will last for a long time. So how do we account for them in calculating CCPH. I have two thoughts on this, depending on if they are small tools (needles, hooks, etc) or large tools (looms, spinning wheels, etc). For small tools, I’m inclined to include them in the cost of the first project I make with them. If I buy a second US 1 needle so I can knit my socks on two circulars, the cost of that needle can be added to the cost of that sock project. From then on, the use of that tool is free. Large tools need to be depreciated in some way. Pick the time period over which to depreciate the tool — a year, two, three, four, five — whatever you prefer. Divide the cost of the tool by the number of years to determine your cost per year. Whenever you use the tool, keep track of how long you use it. Keep a running total of the number of hours you use it as well as the number of hours used on a specific project. At the end of the year, divide the cost per year by the number of hours you used the tool that year to determine your hourly cost for use of the tool. For each project using that tool, multiply the number hours of use by the calculated hourly cost of the tool. Once you come to the end of your depreciation period, use of the tool is free. 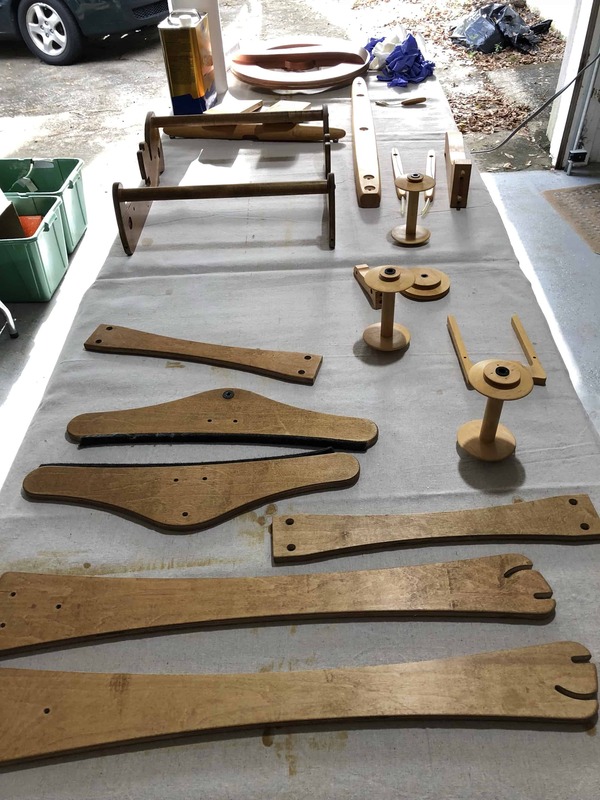 Even with the use of a relatively expensive tool, and a modest amount of use of the tool (less than 1.5 hours / week), each project’s cost per hour of crafting is modest. What happens if we decide to depreciate the spinning wheel over just one year, still with the same modest use of the wheel? While the cost per project and CCPH at least triple, the CCPH is still incredibly low. On a per hour basis, depreciating the spinning wheel over one year with less than 1.5 hours use in a week, costs about the same as going to a movie in the theater. Once I’ve finished depreciating the wheel and the use of it no longer counts in my cost per project, the CCPH of my spinning projects will be pennies. Obviously, this calculation will vary wildly depending on the price of the tool, the time period you choose for depreciation, and your actual use of the tool after you purchase it. But that’s to be expected. I’m just offering a way to capture this cost on a per project basis. And perhaps a useful analysis to justify the purchase of your next loom or spinning wheel! I think the total time for a project can and should be increased to account for the other benefits we receive from pursuing our fiber crafts. This might sound like cheating, because you will be double-counting time, but let me see if I can convince you otherwise. I can knit or crochet or spin or weave in a variety of circumstances. I might be at home alone, doing nothing but knitting. I might be home with my husband, watching TV in the evening. I might be in public, doing a demo where I am specifically looking to interact with people and explain what I’m doing. I might be in public, waiting for an appointment to start or flying on a plane. I might be hanging out with friends, at knit night, at a retreat, or in a cabana by the river (like I was yesterday). Each of these scenarios offers me benefits that aren’t specifically related to my fiber crafting. Time that might otherwise be wasted feels productive. Friendships grow, providing a sense of emotional well-being. I get some down time and to be outside. I don’t have to be fiber crafting to get these benefits — I could hang out in a cabana by the river with friends and just chat all day without doing fiber crafts at the same time. Fiber-crafting while also accruing these other benefits is multi-tasking. Therefore, the time should count more than once — the first time it counts as time accrued for the finished product and the next time it counts as time accrued for process. 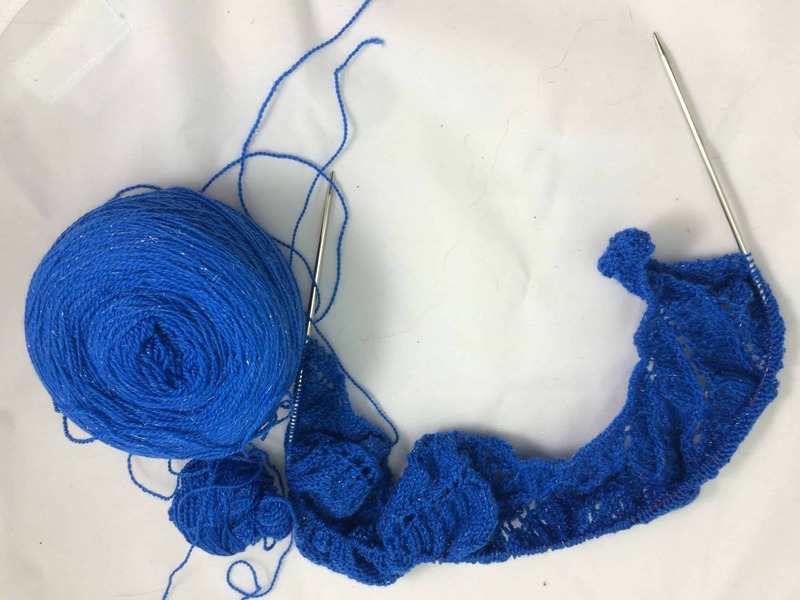 In addition, double (or perhaps triple or quadruple) counting time builds into our equation, and our response to the Inquisitor, all the very personal reasons why we knit. We can give what sounds like a practical, emotion-free, by-the-numbers response while simultaneously honoring rather than denying the real soul of our work. We don’t have to share all those details with the Inquisitor — that would defeat an important purpose of the CCPH calculation — but we know we’ve included, rather than denied, what is truly important to us. The amount of time to count for these extra benefits is up to you. If I’m waiting for an appointment or knitting while watching TV, I’m unlikely to double-count all that time. In these instances, I’m turning otherwise unproductive time into productive time by knitting. This time is tied very closely to the product rather than the process. It’ll take 20 hours to knit these socks, regardless of circumstances, and I’ve just captured a particular piece of those 20 hours. In the case of knitting while watching TV, did I turn the TV on as background for my knitting? Or would I watch TV anyway? Either way, I’m not getting a huge amount of value out of the TV watching. Maybe I’ll double-count 25% or 50% of the time. On the other hand, when I spend a day fiber-crafting in a cabana by the river, I am receiving multiple benefits above and beyond the fiber work. I’m outside, which is a huge benefit in and of itself. I’m with friends. Maybe I should triple-count all the time I’m crafting at the river. And even when I’m not actively fiber crafting, because I’m grilling burgers or eating, I still count that time towards my project because I wouldn’t be there if it weren’t for the fiber. The important thing here is to honestly account for the benefits you are receiving from the fiber crafting. You don’t have to justify yourself to anyone else. You just need to be honest with yourself. “We can make our own retreat,” I responded. And so we have. This weekend, six of us our staying in a condo on the beach. One or two others are driving in for the day on Saturday. I’m the only one who knows everyone going. Everyone else knows no more than two others and some (including Lorelle) don’t know anyone other than me. We have no firm schedule. Everyone’s bringing their projects. Via e-mail, everyone shared what they are bringing and what they’d like to learn. Fredi’s bringing unwashed fleece and will show us how to wash it. She’s bringing her drum carder and hand combs so we can make rolags if we wish. I’m bringing all my acid dyes and equipment for dyeing, including bare yarn. Dawn’s bringing bare fiber. Dawn, Nancy, and I are all bringing our rigid heddle looms. Shellee and Lorelle have never woven before and want to try it out. Everyone except Shellee spins; she’s going to try the spindles Nancy and Dawn are bringing. Everyone else is also bringing their spinning wheels. Shellee will show us her unique method of knitting. She speeds along so fast, her hands are a blur. 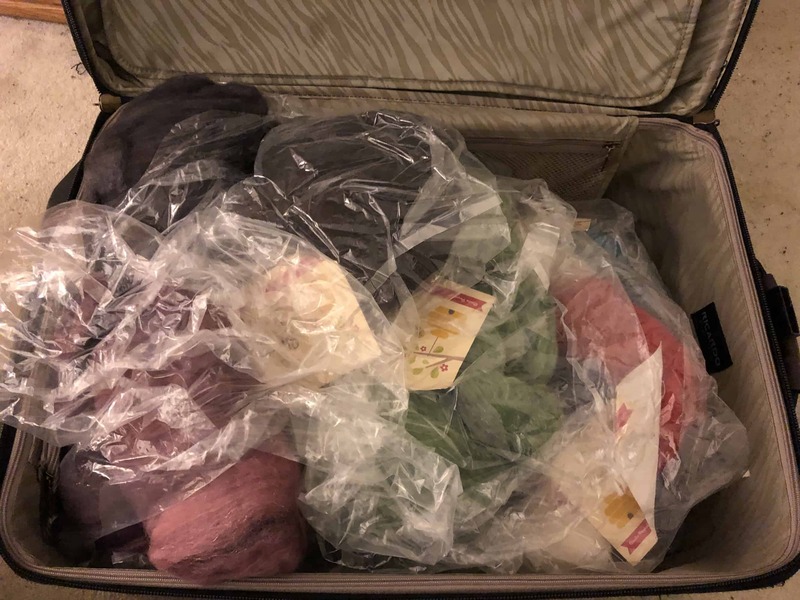 So now I’m packing, and I must consider the first question — the one a fiber crafter always asks before she packs anything else — which projects shall I bring? How many is too many. I’m definitely bringing the current project on my rigid heddle loom. I’ll bring yarn to warp the loom again, in case I finish this project. I have at least 3 spinning projects in progress, but I’m only going to bring the Three Feet of Sheep with me. I really run into trouble with the knitting projects. Shall I bring the Bubble Baby Blanket that I haven’t worked on in months, but is part of my Detention OWL for the Harry Potter Knitting / Crochet House Cup (HPKCHC)? Or the Begonia Swirl Shawl that I started months ago to replace the one that was accidentally felted? Of course I’m going to bring the Cloisters Shawl I only started working on a week and a half ago! I need to bring some crochet. Because I must have all the things, right? I’ll probably just toss some cotton and a hook into my bag so I can whip up some quick dishcloths. Maybe 2, no 3, who am I kidding 4, better make it 5, seriously 6 skeins is the limit. Am I bringing enough? Better toss in just one more thing — I don’t want to run out of projects. Oh! Shellee is bringing blocking mats and wires. I need to bring the 3 shawls I have laying about that just need blocking! Author KarenPosted on January 15, 2016 January 15, 2016 Categories Crocheting, Dyeing, Fiber Events, Knitting, Spinning, WeavingTags all fiber all the time, baby blanket, beach, Begonia Swirl Shawl, christmas houndstooth, Cloisters Shawl, friends, local retreat, shawl, Three Feet of Sheep1 Comment on How Many Projects? I have not yet written crafting goals for 2016. November and December were pretty crazy around here! First was my mother-in-law’s 80th birthday on Thanksgiving Day. Then there was the Weavers of Orlando Annual Sale, followed the next weekend by the Holiday Party. Then we had Christmas festivities with my family. On December 28, I flew to Indiana to play matron of honor for Stacy’s wedding on January 2. Chris flew up on December 31 so we got to spend New Year’s Eve together. We just flew home this afternoon, to a cooler and wetter Florida than I left last Monday. Stacy’s reception was held in a building at the same fairgrounds that hosts The Fiber Event. It was so strange to be in that building without seeing rows of lovely fiber, yarn, and tools for sale! 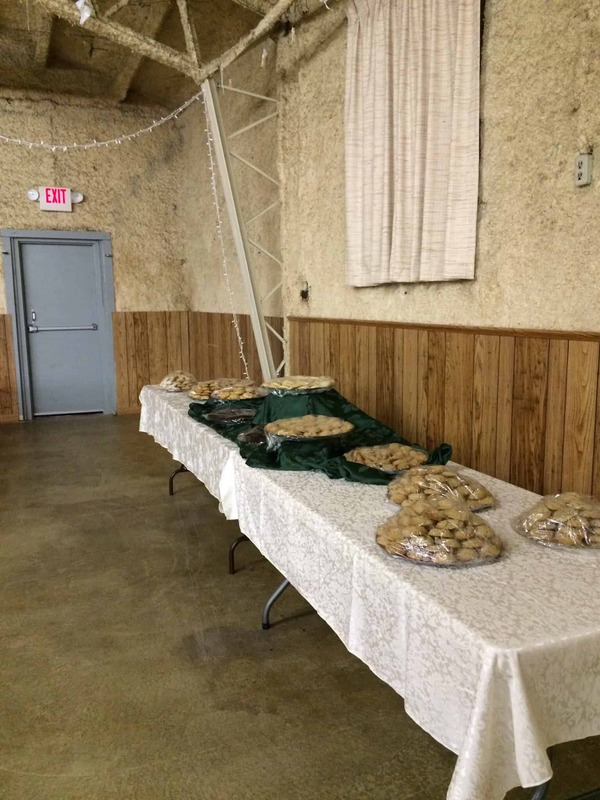 This past week has been busy as the wedding preparations including baking 680 cookies and a 5-tier wedding cake! Stacy, her mother, her aunt, her sister-in-law, and I baked the cookies last Wednesday. 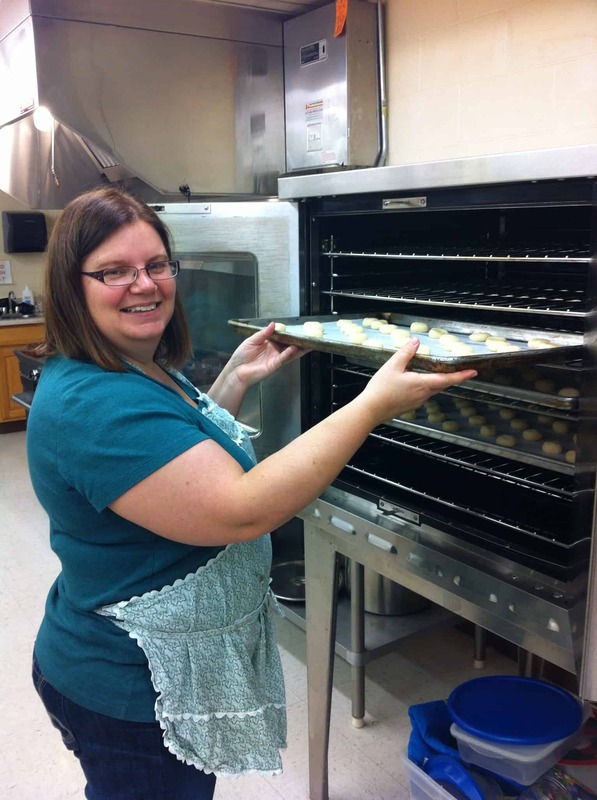 Fortunately, we had the use of Stacy’s parents’ church kitchen, which had a commercial oven that could fit 150 cookies at once. We baked all 680 cookies in only 3.5 hours! Here I am putting the last batch in the oven! After baking cookies, we started on the cakes. I was the lead decorator and giver of orders, as I have been decorating cakes since I was 12! I made the cakes and the lemon curd. Stacy made the chocolate ganache and all the buttercream and mixed lemon buttercream and raspberry buttercream. 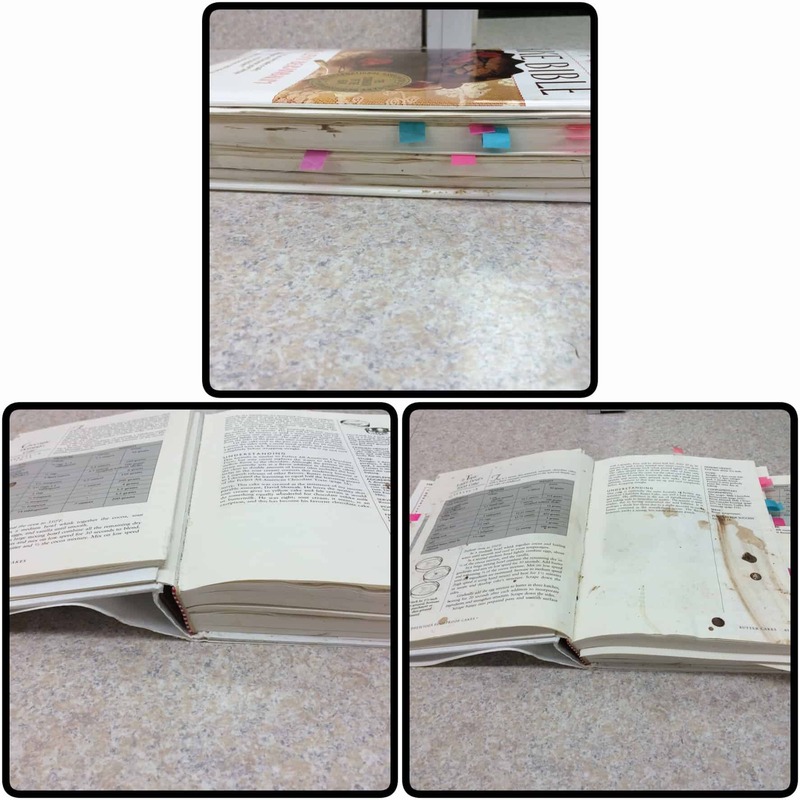 I may have used this cookbook once or twice. 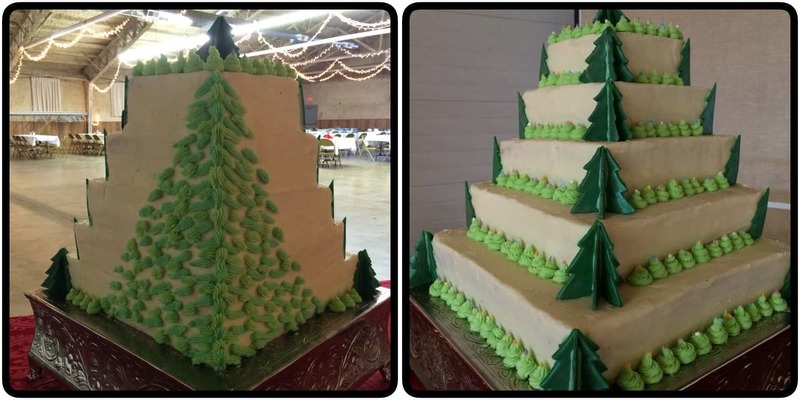 Her mother and aunt cut out fondant Christmas trees and painted them with powdered food coloring. I showed Stacy’s sister-in-law how to pipe miniature Christmas trees and she cranked out 250 of them, while Stacy’s mother went behind her putting the little stars on top of each tree. Stacy’s brother cut the dowel rods that help support each tier (using a pipe cutter borrowed from a cousin) and her father cut and sharpened the dowel rod that goes from the top to bottom through all the tiers. 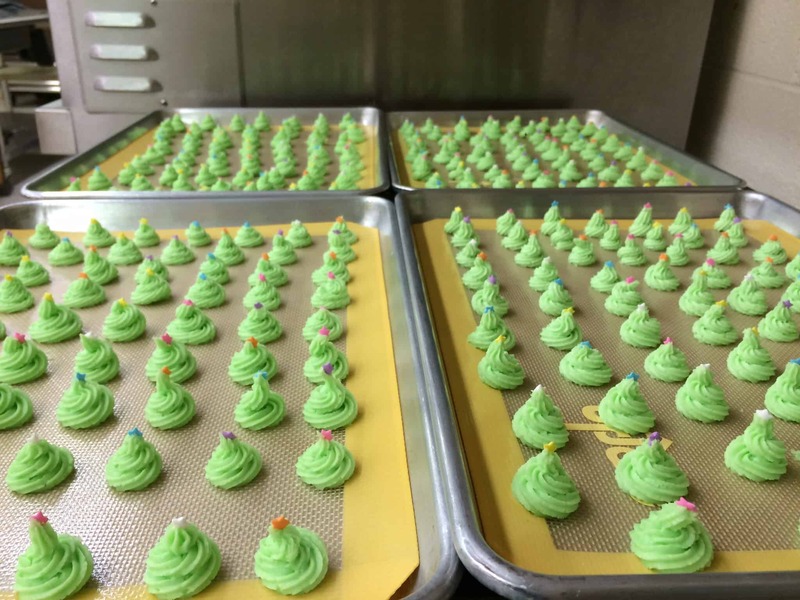 When it came time to stack all the cakes, Chris helped me line up my edges correctly. At every step of the way, Stacy and I discussed colors and placement of pieces. This is the first time I’ve made a cake in such a collaborative fashion. It was so much fun, and I love the result! Now that the wedding is over and I’m home, it’s time to look ahead and lay out my goals for 2016. Before I start making ambitious plans for myself, I wanted to look back at 2015, to see what I finished and what remains unfinished. I’m working on a slide show of all the projects I finished this year, and I will publish that later this week. Today, I’m making a list of all my WIPs. It’s a scary list, even though it only includes projects I’ve actually started, not everything in my mental queue! I still have all the sweaters I got from S. They need to be seamed and blocked. I believe there’s 10 or 11 projects right there! I need to knit or crochet 18 each of 25 different patterns. This is a list of the knitted dishcloths I’ve finished. I need to knit or crochet 18 each of 25 different patterns. This is a list of the crochet dishcloths I’ve finished. Since the only loom I’ve been using is my rigid heddle, I only have one weaving project in process! I started this scarf on December 5, 2015 while at the Weavers of Orlando Annual Sale, so that I could demo weave. I talked to many people throughout the days of the sale and did a fair bit of weaving. I haven’t had time to work on it since. In addition to this project, I now have the storage unit full of weaving things to sort. This includes minor repairs to one loom (the 36″ Harrisville) and probably a complete refinish of a second loom (the 48″ Macomber). I’m hoping to the the storage unit cleaned out by mid-February, though the refinishing job will most likely take longer than that. 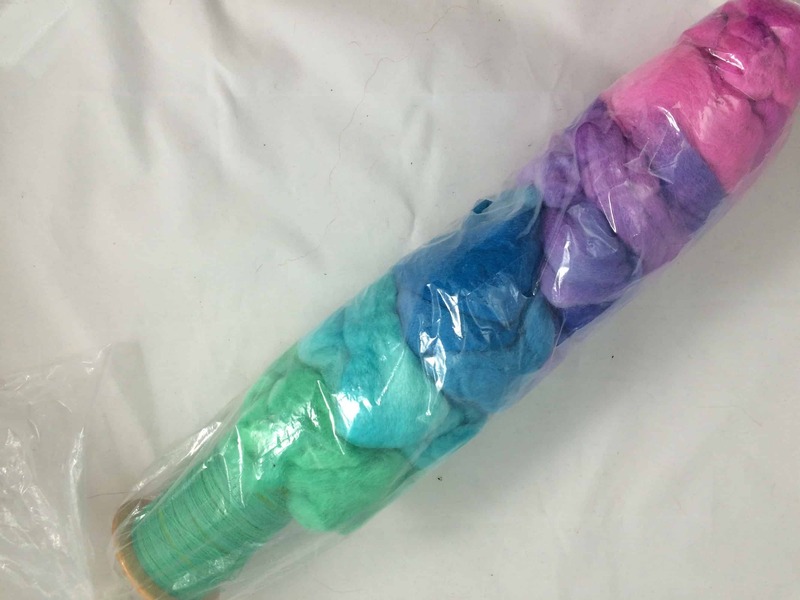 Dyeing doesn’t really have WIPs as something is either dyed or it isn’t. But this is a list of dyeing projects I’ve been meaning to do but haven’t. I’m not sure if this is actually all my WIPs. It’s everything I could find laying about or listed in my Ravelry project pages, but I’m sure I missed more. I haven’t updated my progress since week 29, back in July! Since we’re coming to the end of the year, it’s time to review my goals and start thinking about goals for next year. Anything that’s crossed through in the list is something I did not get to at all. If I did any work on a goal, even if it isn’t finished, I kept it on the list and made notes about its status. In early January, I will publish a slide show with pictures of every project I finished this year and a list of goals for next year. While I didn’t finish everything I hoped to finish this year, I am happy with what I accomplished. 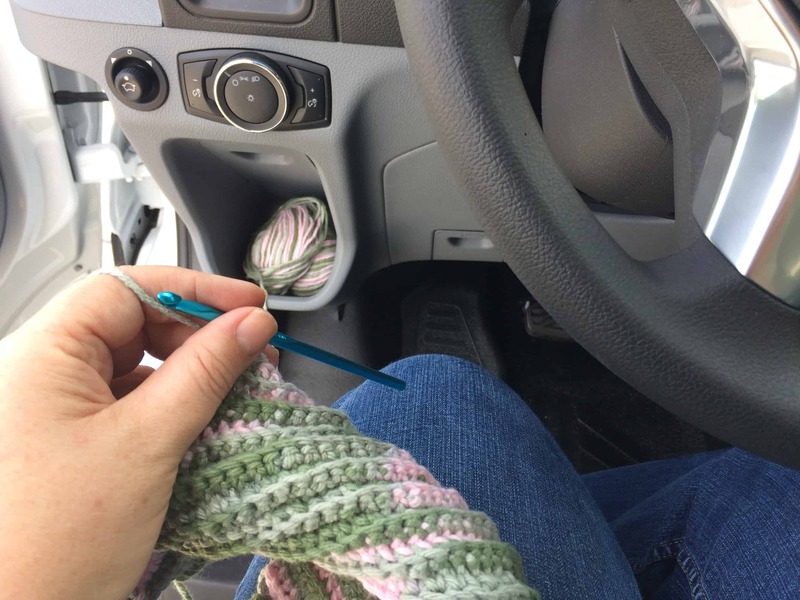 I learned a great deal, especially about crochet, and I’m looking forward to learning more in 2016! Knit myself a sweater Moved to 2016. In July, my friend Stacy got engaged and I’ve been working on projects for her wedding instead of knitting a sweater! I did actually finish the swatches by the dates listed here. I went to Masters’ Day at the TKGA Conference and learned that I had guttering issues I need to work out before finishing my swatches. I haven’t gotten back to my swatches yet. This is different than the Traveling Scarf listed above under Charity Knits. This one is still in progress! Learn all the basic crochet stitches. Erf is an accomplished weaver who has studied Shaker textiles for at least 30 years and has woven many reproduction rugs (and other textiles) which appear in Shaker museums. Her introduction describes the history of Shaker textile production, provides background on the Shaker Millenial Laws which governed all aspects of Shaker life including the colors used in textiles created in the Shaker villages, and tells how she discovered a familial connection to one of the Shaker communities. In the introduction, Erf mentions that Shakers used rugs created using a variety of techniques. However, all the rugs in the second half of the book are “weft-plied rugs.” This term is never explicitly defined in the book, and I was confused until I got to the end of the introductory material, where she describes the general steps of recreating the rugs. It means that the Shakers took three (or, more rarely, four) strands of finished carpet wool yarn and plied them together on a spinning wheel, using the newly created chunky yarn as the weft in the rugs. The three strands were each a different color, creating a barber pole look in the new yarn. Sometimes the new yarn was plied with a Z twist (spun in a clockwise direction) and sometimes it was plied with an S twist (spun in a counterclockwise direction). Often, one rug contains both Z twist and S twist yarns. The Shakers placed Z and S twist yarns next to each other in the weaving, which creates chevron patterns. Wool fabric strips were used as weft to separate patterned sections of the plied wool weft. The book focuses on the weft-plied rugs because this style is known to be created by the Shakers themselves not commercially made, the technique is unique, and several examples of original weft-plied rugs still exist. The second part of the book describes the process of reproducing approximately 20 specific rugs which are part of museum collections. This section of the book is organized by Shaker community; the rugs represented in the book come from five different communities in the eastern United States. For each rug, the author starts with a page analyzing the details of the original rug, including the dimensions of the rug, the type of yarn and fabric used for warp and weft, the twist direction of the weft yarns, and any other distinguishing characteristics. She also includes at least one picture of the original rug. This analysis is followed by the details of how to reproduce that rug, including which yarns and fabrics she used and which Cushing acid dyes she used to make colors that match those in the original rug. Many of the rugs are finished with handwoven bias tape; the book also includes analysis of the tapes and instructions on weaving them. I’m always on the hunt for fiber arts books that are more than just patterns or drafts. I love books of essays or history and detailed techniques. Weaving Shaker Rugs has all of this, as well as detailed instructions for making the Shaker-style rugs. Since following the instructions requires flipping back and forth between the general instructions in the introduction, the pages for the specific rug you’re attempting to reproduce, the glossary, and cross-references in Peter Collingwood’s out-of-print book The Techniques of Rug Weaving, I expect it will be challenging for anyone, especially a new weaver like me, to actually create a Shaker rug using this book. While the projects are more involved than I’m ready to take on as a fledgling weaver, I did learn a lot about the Shakers and rug weaving. I enjoyed reading the book from cover to cover and will keep it on my shelf for when I’m ready to tackle a Shaker-style rug!